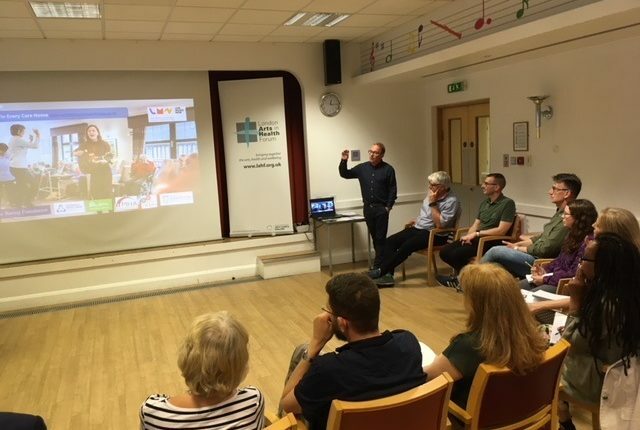 A conference hosted at Nightingale Hammerson’s Nightingale House in Clapham has explored the impact of music in elderly care. Held in partnership with Live Music Now and the London Arts in Health Forum, the event focused on how to bring music to life in care homes. Alastair Addison, Head of Activities at Nightingale House, said: “The conference is another example of our innovative music strategy, as part of our wider commitment to delivering person-centred care. Key-notes speakers included members of the All-Party Parliamentary Group for Arts Health and Wellbeing, which published an enquiry entitled Creative Health in 2017. Co-Chair of the group, the Rt Hon. the Lord Howarth of Newport MP CBE, reviewed potential policy recommendations aimed at incorporating greater use of the arts and music in health and social care. Deborah Bull CBE, a former dancer with the Royal Ballet and now Assistant Principal for London at King’s College London, addressed residents, staff and researchers and discussed the role of the arts and music in developing health. Other conference attendees included leading practitioners from arts, health and social care, Andrea Sutcliffe CBE, Chief Inspector of Adult Social Care at the Care Quality Commission, Gemma Jolly, Knowledge Manager at Alzheimer’s Society, Rebecca Blackman, Celebrating Age lead at Arts Council England and Evan Dawson, Executive Director at Live Music Now.